According to a researcher at NASA, the deluge that killed over 300 people, could have been contained if the dams were opened is a systematic manner. 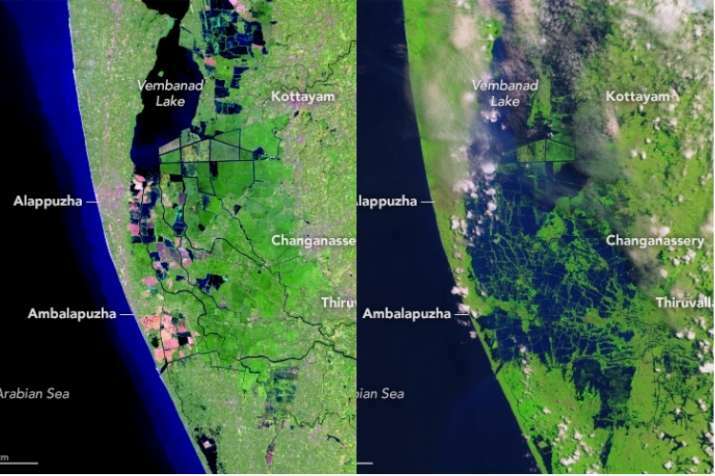 The US space agency NASA has released the before and after images of "once-in-a-century" flood in Kerala. 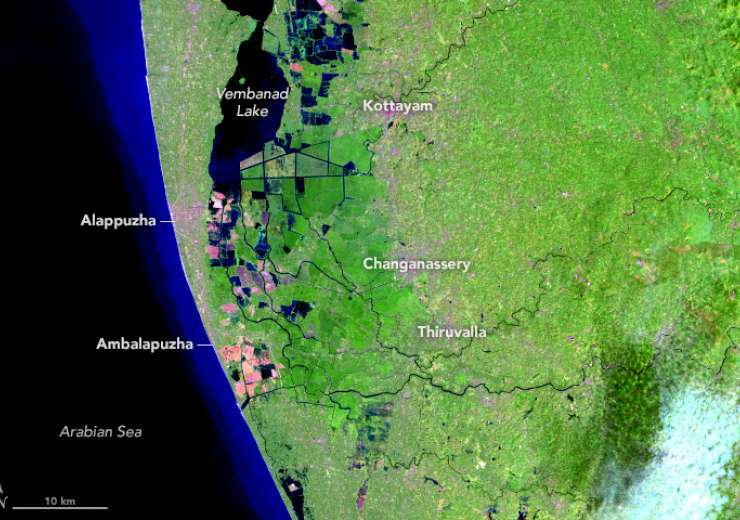 The satellite images taken six months apart show the area surrounding the Vembanad lake, including areas in Alappuzha, Kottayam, Changanassery and Thiruvalla. The first image, captured on February 6 by the Operational Land Imager (OLI) on Landsat 8 satellite, shows the area before the flooding. The second image, taken on August 22 by the European Space Agency’s Sentinel-2 satellite, shows the level of flooding in those areas following heavy rainfall.The images are false-color, which makes flood water appear dark blue. Vegetation is bright green. The images clearly show the conditions after several rivers throughout the region spilled over their banks. Water from the Karuvannur River ran through 40 villages, and washed away a 2.2 kilometre stretch of land connecting two national highways. Elevated water levels along the Periyar River displaced thousands of people. Also read | Kerala flood less intense than deluge of 1924: So why was damage as devastating? The Operational Land Imager (OLI) on the Landsat 8 satellite acquired the first image on February 6, 2018, before the flood. The Multispectral Instrument on the European Space Agency’s Sentinel-2 satellite acquired the right image on August 22, 2018, after flood water had inundated the area. Abnormally heavy monsoon rains drenched Southeast Asia, leading to the worst flooding in the state of Kerala since 1924. 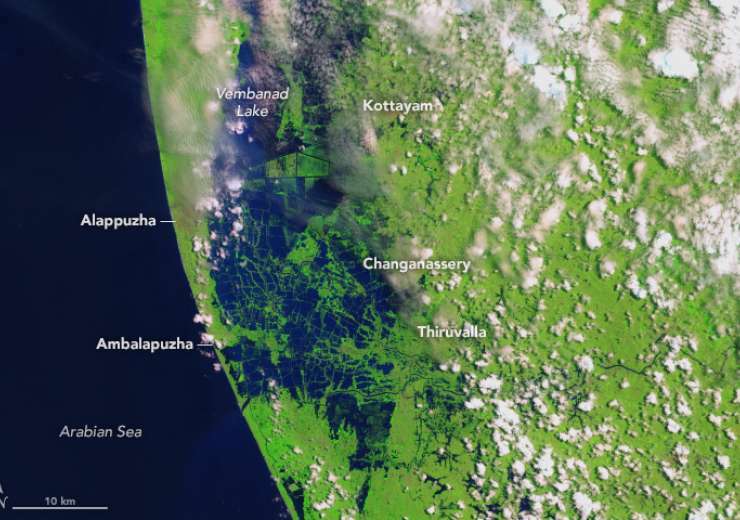 The event, which started with rains on August 8, 2018, displaced over a million people, led to hundreds of deaths, damaged over 50,000 houses throughout the region, and severely affected 13 of the 14 districts in Kerala, NASA Earth said in a report earlier. According to a researcher at NASA, the deluge that killed over 300 people, could have been contained if the dams were opened is a systematic manner. “The dam releases came way too late, and it coincided with the heavy rain that was occurring,” said Sujay Kumar, research scientist at NASA's Goddard Space Flight Center. Rainfall peaked in Kerala on July 20 and again reached abnormally high levels between August 8 and 16. Since the beginning of June, the region received 42 per cent more rainfall than normal for this time period. In the first 20 days of August, the region experienced 164 per cent more rain than normal, the space agency said. Adding that even as Kerala's August rain played a part in the nearly once-in-a-century flooding, the flooding was worsened when water was released from several full dams. Instead of gradually releasing water during drier times, authorities were forced to open 80 dams in the region, including the Idukki Dam, which is one of the largest arch dams in Asia. Thirty-five of those dams were opened for the first time. Intense rainfall events have hit other areas of Southeast Asia as well. Eastern Myanmar experienced torrential downpours in mid-July and August, causing fatalities and displacing 150,000 people in one month. The floods were the worst in 30 years. The Bago and Sittaung rivers swelled to their highest levels in more than five decades, with the Sittaung river 7 feet above danger levels in areas.